This was our first cruise aboard a Celebrity cruise ship. It was the Millennium. To the right is our trip. This is the beginning of our cruise. Our cabin door. Very nice wouldn't you say? This is our cabin as you look in from the doorway. Our ship, The Millennium, where we docked in Key West. The view looking down the promenade deck. Note the inability to walk all the way around the ship. I really missed that on this ship. The Aqua Spa on board. The pool here is about 3-4 feet deep with lots of warm saltwater being pumped all around. At the back edge are metal tubes side to side in the shape of a lounge chair where you can lay and have water jets massaging your back side. They also had very warm saltwater whirlpool tubs as you see in the left foreground. Another view of "The Spa". Some of the many unusual decorations in the spa. Lots of fake fruit stuff. It was nice though. The pool(s). The one in the foreground was about 5.5-6 ft deep the entire length. I'm not sure about the one in the background. We never went in it. It did have "shelves" on each side under about 6" of water where you could sit in the water and dangle your feel without getting all the way into the pool. Our favorite band (Onyx) is on stage in the background. Trouble with Key West and the Costa Alantica in the background. The very beginning of route 1 down in Key West. This highway extends all the way up into Maine. Picture speaks for itself here. "The Whitehouse" where Truman spent time while in Key West. A find feathered friend we encountered while walking around the are of the Truman complex. Yes, I'm strange. I took a picture of a front door to someone's house. It was just such beautiful wood, I had to take the pic. The Costa Alantica as they were leaving Key West. We met up with them again in Grand Cayman. The "pointy" end of the Atlantica. One of the luxurious docks in Calica Mexico. Our dock in Calica. Basically, you either went to Cancun or Tulume by bus, or you hit the tents the locals set up. This is just an industrial dock. We visited the tents and spent the day on the ship. The German ship Arkona docked next to us in Cozumel. Carnival Celebration coming into Cozumel. And one of Celebrations sisters. The close-up view of Georgetown Grand Cayman. This is the area where the tenders drop you off from the ships. There is no dock in Georgetown, so we have to anchor out and tender into town. Georgetown as seen from the ship. Patty and the Hard Rock Cafe. Check out the fancy new sunglasses she's sporting!! A casualty of shopping at "De Sunglass Man". Someone with WAY too much money. The 15' inflatable tender approaching from the rear is about $25,000. Our old friend the Noordam of Holland America Line. I believe this was the Enchantment of the Seas. A Royal Caribbean ship in any event. The Enchantment and the Millennium anchored just off Georgetown. The Persistent. A U.S. Naval ship of some sort, but I have no idea what. Notice the gray colored "go-fast" rigid hull inflatable boat up on top. Sunrise over Cuba. If you look closely, you can see the mountains. Also, if you were paying close attention, you will realize this couldn't be sunrise over Cuba with the itinerary listed at the very beginning of this page. That's because they goofed on the itinerary picture. 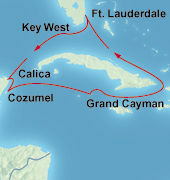 We actually went around Cuba to the west side as we left Grand Cayman. A bell (from the SS Olympic???) on display outside the Millennium's Olympic restaurant. The Olympic is an alternative dining restaurant aboard the GTS Millennium. You have to pay $25 per person extra for a meal here, but the service and style is second to none. Just like in the days of the SS Olympic, sister ship to the Titanic. The sitting area inside the Olympic. The walnut wood paneling in this restaurant, is the actual paneling from the restaurant on board the SS Olympic. It was salvaged from the ship when it was scrapped in the 1930's, installed in a house in England, and then Celebrity Cruises bought the house, salvaged the paneling once again, and installed it here. A view looking into the "big" portion of the dining room. Sorry about the picture quality. It was fairly dim lighting. Our table for the evening we dined here. I lost count after about the 5th or 6th waiter to wait on us that evening. The grand staircase in the atrium of the Millennium. The sun sets on our trip about the GTS Millennium.